Sometimes, I simply enjoy a book because it is purely entertainment. This is how I felt about the Gossip Girl series, and The Clique series. And now, after reading Broken Hearts, Fences and Other Things to Mend, the Broken Hearts & Revenge series has been added to that list. Seriously, it was no hardship to read Broken Hearts. It was fun, it was easy and it was really compelling because it was so over-the-top. The situations that Gemma found herself in, both as a child and as a teen, were definitely dramatic. Emotions were heightened, choices were made that weren’t always the sanest or best, and everything just served as a source of amusement. The story played out the way a TV drama or a made-for-TV movie might, with plenty of exaggeration, humiliation and deception (that only the reader knew of). The thing is, I’m not overly fond of either Gemma or Hallie. Gemma lacked personality to me, and it really bugged me that she would adapt to become whatever she needed to be in any of her relationships. In retrospect, I suppose it’s fair to conclude that she’s still in an exploration stage, and figuring out who she might really be, but still, her lack of qualities that were uniquely her really got to me. Hallie, on the other hand, is practically a stranger. Gemma feels guilty about hurting Hallie when they were kids, so she’s painted as a victim and as someone Gemma really wants to make things right with. I had my own opinions about her, but a part of me does wish that we knew what was really going on in her mind. Honestly, the only character I even remotely liked was Josh. He was sweet, and thoughtful, and just a wonderful boy. It was totally easy to see why Gemma would have a crush on him! But yes, the shenanigans that ensue during Gemma’s summer in the Hamptons are really fun (and funny) to read about. She jumps through all these hoops in an effort to befriend Hallie and make up for what she did. Let’s just say that some of those hoops involve embarrassing situations or moments that test Gemma’s patience and pride! There were definitely moments that made me cringe, and others that made me giggle, and still others that had me shaking my head. It was all around chaos, but really engaging too! 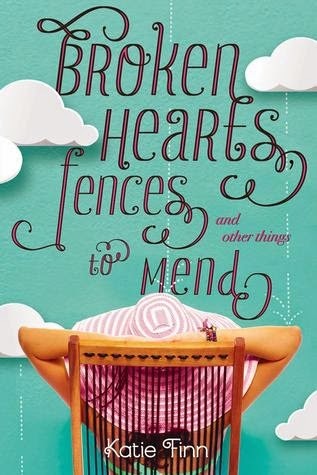 While I wasn’t completely taken with Broken Hearts, Fences and Other Things to Mend, I can’t say that I didn’t have fun reading it. In the end, that’s probably my biggest takeaway. Even though things got a little crazy and dramatic, even though I totally called most of the plot twists, sometimes, you just want to read something fun – and that’s precisely what this novel has got to offer. What's your signature summer drink? If I remember correctly, Gemma was always drinking iced soy vanilla lattes, which is how this question came to be. Personally, I prefer drinking iced chai tea lattes! They've always been a favorite for me. I drink it nearly every single day during summertime (and get the hot version a ton during colder seasons). I enjoyed this book too and completely agree with everything you've said here. The characters were not exactly likeable, but the story itself was just too fun to not like it. It definitely had that Gossip Girl feel to it and I am a HUGE fan of Gossip Girl so anything similar, I will usually enjoy. I think I burned myself out when I was younger by reading every Gossip Girl, Clique, Alphas, A-list (pretty much everything by Poppy!) book in existence because now I avoid the drama, light fun reads. Thanks for the review though! I think my signature summer drink would be a tall glass of iced black tea. I have been seeing this around, and I think this might be a good pick me up book for those who are in book slumps, or those who are having a hard time moving on from a very heavy book. I might try this one soon because you make it sound so fun! Great review Alexa. I also enjoyed reading this book just because it was fun and easy to read, I'm worried by the ending though... And Josh was adorable!